The chronically ill, such as those undergoing cancer treatments and individuals with AIDS, diabetes or kidney disease, are more susceptible to contracting a foodborne illness because of their weakened immune systems. Once contracted, these infections, with their severe vomiting and diarrhea, can be difficult to treat, and they can come back again and again. Three types of bacteria that grow on food and cause foodborne illness are of particular concern for persons with weakened immune systems. For example, AIDS patients are 100 times more likely to become ill from salmonella, 35 times more likely from Camplobacter and also much more likely to get listeriosis (which is often fatal for AIDS patients) than the otherwise healthy person. Salmonella bacteria, the most common cause of foodborne illness, are commonly found on raw or undercooked meats (especially poultry) and can be found in eggs even before they are cracked open. Camplyobacter jejuni bacteria are also found on raw poultry, but raw milk and contaminated drinking water can also be sources. Listeria monocytogenes bacteria are found in a variety of foods including soft cheeses that are unpasteurized and some ready-to-eat foods such as hot dogs or deli meats. At-risk individuals should not eat the latter foods unless these items can be reheated until they are steaming hot. Since most foodborne illnesses result from improper handling of food, people who are ill, and those who are caring for them, should follow basic food safety guidelines. For persons with weakened immune systems, it is especially important to read food labels to select foods that pose the least risk of food poisoning. For example, all milk and cheese products should have the word “pasteurized” on the label. Products that contain any raw or undercooked meat or dairy products should be avoided, as well as products with a “sell-by” or “best-used-by” date that has passed. Place packaged meat, poultry or fish into a plastic bag before placing it in the shopping cart to prevent drippings from coming in contact with other foods and thus reduce the risks of cross-contamination—bacteria from one food contaminating another food. The sale of food products with damaged packaging, the unsafe displaying of products (such as cooked shrimp on the same bed of ice as raw seafood), workers with poor personal hygiene and unsanitary store conditions can add to the risk of foodborne illness. Consumers should avoid purchasing food products sold under such conditions and report these conditions to local health authorities. After shopping, get chilled and frozen foods into the refrigerator or freezer as soon as possible. Storing them in a warm car or office, or even just carrying them around for a couple of hours, can raise the foods’ temperature enough to allow bacteria to grow. Improper food handling or preparation in the home causes most cases of food poisoning. Keeping shelves, counter tops, refrigerators, freezers, utensils, sponges and towels clean is one of the best ways to prevent bacterial contamination of food at home. It is especially important to wash all utensils and your hands with soap and hot water after handling one food and before handling another. This helps prevent cross-contamination in which, for example, bacteria in raw meat could be transferred to other foods, such as salads or vegetables. For the same reason, wooden cutting boards should not be used for cutting raw meat, poultry or fish. Plastic boards are easier to clean and sanitize. However, wooden cutting boards used exclusively for raw meat and poultry are acceptable. Use a different board for cutting other foods such as produce and bread. Wash cutting boards with hot, soapy water after each use; then rinse and air dry or pat dry with fresh paper towels. Non-porous acrylic, plastic or glass boards and solid wood boards can be washed in an automatic dishwasher. (Laminated boards may crack and split.) Sanitize both wooden and plastic cutting boards with a solution of one teaspoon liquid chlorine bleach per quart of water. Flood the surface with the bleach solution and allow it to stand for several minutes, then rinse and air dry or pat dry with fresh paper towels. 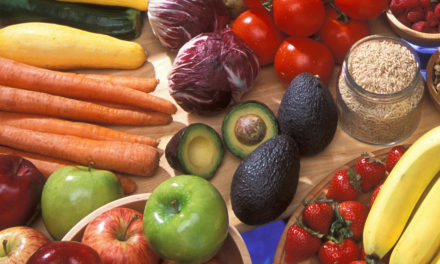 Fresh fruits and vegetables should be thoroughly washed with water and refrigerated to reduce spoilage. 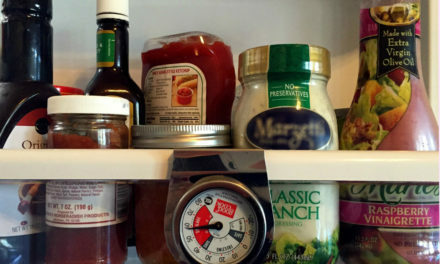 The temperature in a refrigerator should be maintained at or below 40 ºF, and food should be stored in covered containers. Properly cooking food is another important guard against food poisoning. Heat kills bacteria. Use a food thermometer to be sure foods reach proper internal temperatures. These temperatures ensure that foodborne bacteria have been destroyed. For reasons of personal taste or texture preferences, consumers may choose to cook meat and poultry to higher temperatures. Chronically ill individuals should never eat raw eggs or foods that contain them. Pasteurized eggs should be used in place of shell eggs when making homemade ice cream, eggnog and mayonnaise. If you cannot obtain pasteurized eggs, then you must omit the egg ingredient when making homemade ice cream. When cooking eggs, make sure that the yolk and white are firm, not runny. Microwave cooking requires special precautions. Most microwave recipes include a “standing time” after the cooking period to ensure that a proper temperature is reached throughout the food. Many microwave dishes must be removed from the oven and stirred to ensure thorough cooking. Always heat pre-cooked foods or leftovers thoroughly, whether in a microwave or conventional oven. Restaurants, like grocery stores, are required to follow sanitation guidelines established by state and local health departments. Chronically ill persons need to avoid the same foods in restaurants that they would at home. Always order food well-done; if it is served medium to rare, send it back. If the center of a steak, hamburger or other piece of meat is the least bit pink or bloody, it should be sent back for more cooking. Fish should be flaky, not rubbery, when cut. Order fried eggs cooked on both sides instead of sunny side up, and avoid scrambled eggs that look runny. Caesar salad should also be avoided since it contains raw eggs. Ask before ordering if unsure about the ingredients in a particular dish. Raw seafood poses a serious risk of food poisoning. Raw shellfish, like raw meat and poultry, should be assumed to harbor harmful bacteria. Oysters on the half shell, raw clams, sushi and sashimi should not be eaten. Lightly steamed seafood, such as mussels and snails, should be avoided.